I honestly didn’t know what to expect with this movie. I don’t think I understood that it was entirely in Italian and exactly what it was about. Luckily, I was pleasantly surprised. Overall as a film, it was extremely refreshing to watch and interesting to watch an Italian film. It’s a culture I’ve been slowly getting more addicted to. 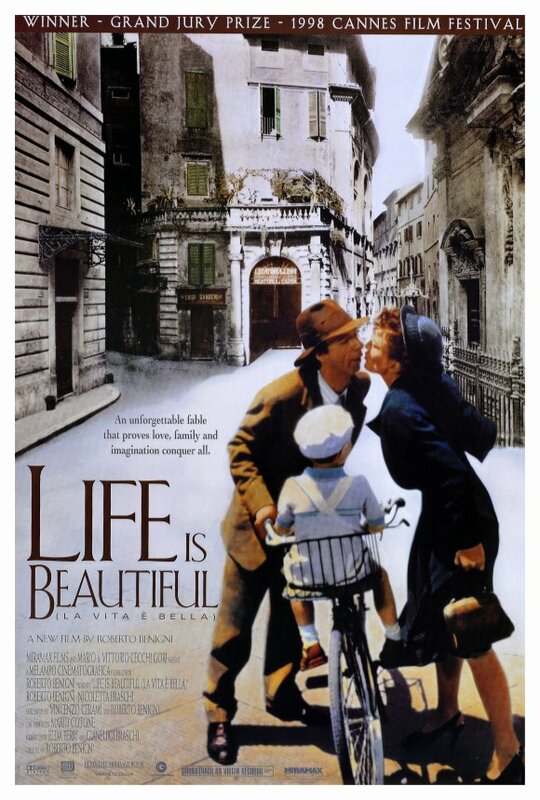 The film is directed and stars, Roberto Benigni. He’s a character to say the least. In real life and in this movie he’s created. He plays Guido Orefice, an Italian- Jewish man. He starts out the film as he was travelling as a young man, going to the town his uncle lives and works. Through out the adventure, you’re filled with comical scenes. Like I said, I can’t express enough on how funny this guy is. He’s the type of guy we all know in real life, who is just never embarrassed, he embraces each moment and add his bit of creativity to. At one point during his voyage to uncle and new life- he stops at a farm. They’re selling a bunch of little things and he decides to pick up a couple things. Moments later, a lady falls out of the barn top and into a pile of hay. Her name is Dora and she becomes his one true love. Though, she doesn’t know that yet. He moves into his new life, and guess who lives in town. Dora. She’s a teacher at a local school and of course- through funny circumstances and his will power to not give up- they fall in love and get married. Have a baby boy too. Years past, they’ve open up a book shop. His son is now a young boy and the war in Italy is getting stronger. As a Jewish, he’s definitely feeling it. Eventually it leads to him and his son being put on a train for a concentration camp. His wife, not being Jewish herself, isn’t on the list. She demands to be put on the train with the rest of her family, and reluctantly, the soldier does so. The rest of this film, focuses on how Guido hides the harsh reality of the camps life to his son. He pretends right from the start this is all a game. He goes to great lengths to pretend and never let his son know the real version of why they’re there, why he’s hiding during the day and where his mom is. Room-mates eventually join in too, just for the little guy’s sake. It’s special to watch and beautiful in it’s own way. Scene after scene you’re watching this man fill his sons world up with buckets of imagination, while keeping it all together. You get to know the character more, how honest and selfless he was. He’s a good husband too, moments during the film- he always had to make sure that even if he wasn’t seeing his wife- she knew that he was thinking of him. I don’t know whether that’s the Italian way of devotion and love, but it was something heart-warming to feel and watch. I won’t spoil the ending, but it ends bittersweet.